Kiel Fjord (Kieler Förde) is a unique piece of nature that stretches right into the heart of the city center. 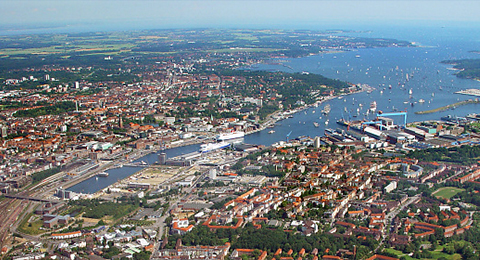 The Baltic Sea divides Kiel into two shores, the east bank (Ostufer) and the west bank (Westufer). On the west bank, the Kiel-Canal flows through the city, dividing it into "north of the canal" and "south of the canal". As the worlds busiest artificial waterway, the Kiel-Canal (known in Germany as the Nord-Ostsee-Kanal), runs for almost 100 km right through Schleswig-Holstein and connects the North Sea to the Baltic Sea. Watch the Kiel image film (German Page). Take a city sightseeing tour by hop-on-hop-off bus, customized taxi or by ship (harbour tour). Residents registration: To register as a resident in Kiel you have to report your address within two weeks of moving to Kiel in the city hall (Fleethörn 9, 24103 Kiel) Registration information (Anmeldung). If you rent an appartment, your landlord has to confirm you as tenant. A certificate of registration and/or a proof of residence can be obtained in the city hall after registration: Certificate of registration and Proof of residence.